You know when something fits you absolutely perfectly and you want to wear it like every single day? Meet that piece of clothing in my life at this moment, the ‘Public Library Dress‘ from August Wrinkle. This dress is AMAZING. I rave about a lot of clothing items, but seriously, seriously, can I live in this dress?? Pairing it with my favorite cozy sweater from Nordstroms, patterned tights, and boots (my go to! ), I wore minimal jewelry and let the dress do all of the talking. I mean polka dots, a pretty collar and cute gold buttons? Does it get any better?! This outfit was perfect for a chilly, WINDY, winter day and transitioned perfectly for dinner in the evening. can i live with you in that dress???!! haha just kidding… kinda. so cute! i love your tights!! oh Ashley, you make my day!!! 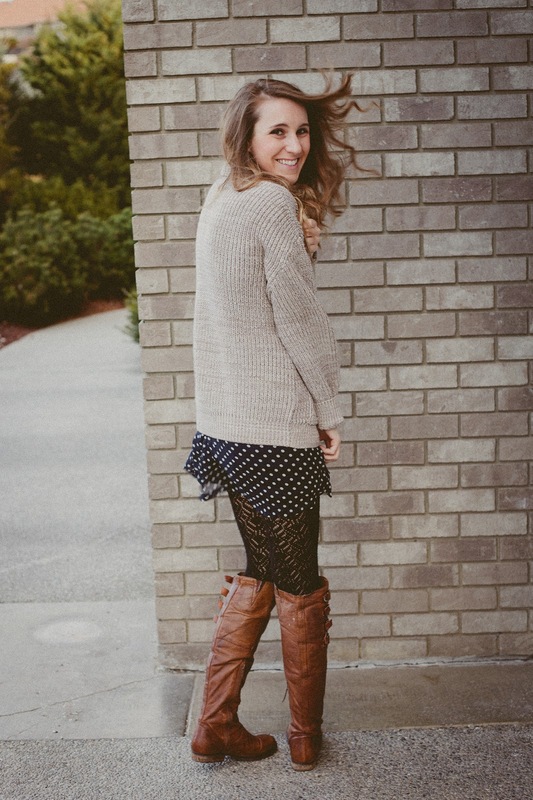 just so you know YOU are one of my favorite bloggers because of your amazlingly cute style. Haha, we're posting August Wrinkle outfits on the same day! 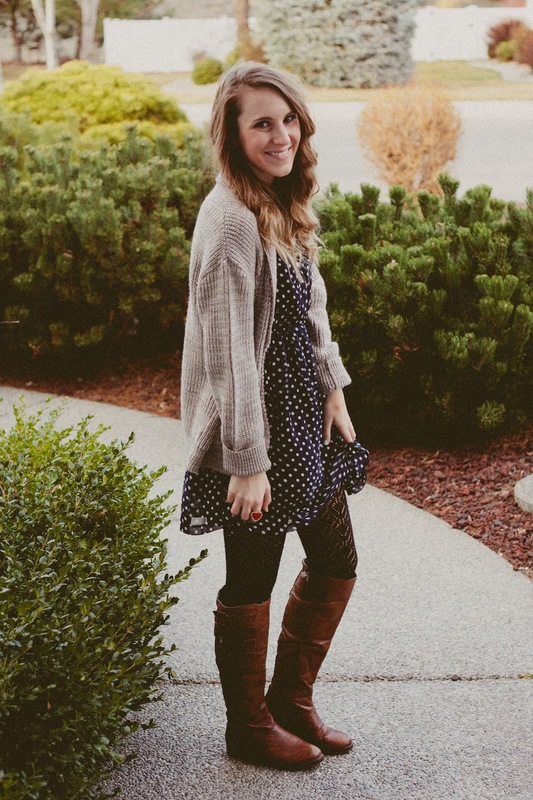 I love this adorable dress on you and how you styled it – the riding boots, cozy cardigan, and textured tights? Oh yes, you know how to layer flawlessly! Ooooh, and I know, I totally sympathize with you on the designing problem…gah, I am so lucky I won a giveaway once from a blog designer…but now, even I'm ready to update my blog. Only I'm the same as you – clueless when it comes to web design. If you find someone let me know! Great post! I love shoes! I love these tights! 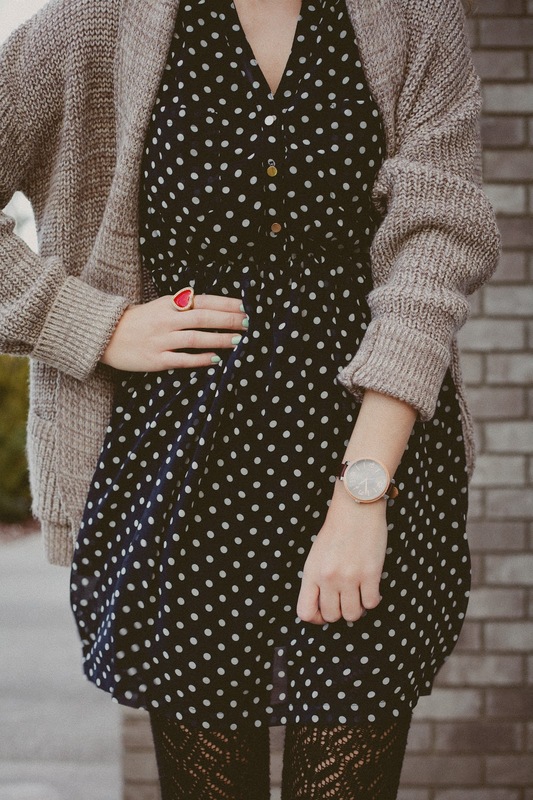 Patterned ones always makes outfits a touch more fun! Such a versatile dress- the color and pattern are great for every season and occasion! This is perfect! Casual and amazing! What a cute dress! And I really love that watch so much!